I've had another bookcase collapse, and so I'm done with Ikea bookcases and am now using industrial shelving, which I don't like one bit, but luckily it's just a temporary solution. My Kiddo has been home since Thanksgiving and helped me put things back in order, and in the process, we found a bunch of books that had been shelved behind other books. These were old copies of books published for girls just before and during WWII that I had used for research years ago. There were also a few older books from WWI. 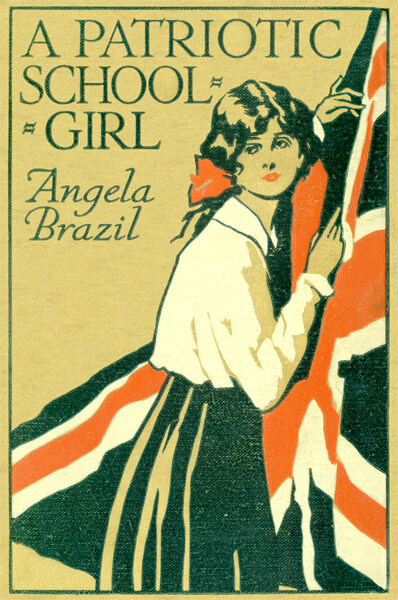 And sure enough, I got pulled into rereading Angela Brazil's WWI book A Patriotic Schoolgirl. Published in London in 1918 by Blackie & Son, it is just one of many of Brazil's boarding school books. A Patriotic Schoolgirl begins just as Marjorie Anderson, 15, and her sister Dona, 13, are about to be sent off to boarding school. Marjorie is an energetic, outgoing girl but one who is prone to acting impulsively. She's already been to boarding school before, so she's looking forward to being at Brackenfield College, playing hockey and making friends. Dona is much shyer and reserved, content to live in Marjorie's shadow, has no interest in sports, doesn't make friends easily, and would much rather continue to be home schooled. As for the rest of the family, they are described as "a large and rambling family." Father is a soldier serving in France; older sister Nora is already married; Bevis is in the Navy on board the HMS Relentless; Leonard is serving in the trenches somewhere in France; Larry has just been conscripted and is going into training; Peter, 11, has been away at boarding school for three years and is returning there again; Cyril is also off to boarding school, and only youngest Joan will stay at home. Due to her own work, Mrs. Anderson must send the girls to Brackenfield alone on the train. After missing their connecting train to London, making them 2 hours late, they meet a kind soldier who helps them with their unwieldily belongings. Unluckily, when they part at Euston Station and the teacher meeting them sees them speaking with a soldier, Miss Norton takes an immediate dislike to both girls. Put into separate houses at school, at first "life seemed a breathless and confusing whirl of classes, meals, and calisthenic exercises, with a continual ringing of bells and marching from one room to another." Eventually, however, Marjorie and Dona find their way. Marjorie makes friends with the other girls in her dormitory, even convincing them to pull a few pranks, while Dona finds herself attracted to the more solitary study of Natural History and Photography. A Patriotic Schoolgirl is basically the story of Marjorie's overcoming her impulsive nature and assimilating into boarding school life. She really loves a good prank, which usually gets her into trouble. But one episode involving a letter she impulsively writes to a soldier has some serious consequences, including a near expulsion. She is told that she has broken school rules and "transgressed against the spirit of the school" with her 'vulgar correspondence." Marjorie has always been extremely patriotic, she "followed every event of the war keenly, and was thrilled by the experiences of her soldier father and brothers. She was burning to do something to help - to nurse the wounded [as her older cousin Elaine does], drive a transport wagon, act as secretary to a staff-officer, or even be telephone operator over in France." Marjorie just wants more than anything to do her bit for her country, which is why she wrote the letter to a soldier in the first place, never dreaming he would write back. When a new girl, Chrissie Lang, arrives after the Christmas break, Marjorie finds a new best friend in her. Chrissie is overly interested in hearing about the soldiers in Marjorie's family, as well as learning about the nearby P.O.W. camp. When suspicious happenings in school are noticed, it appears there might a spy in the school. But is it Miss Norton, aka the Acid Drop, who has her own secret, or could it be someone else. And Marjorie is determined to find out just who it is. I really love a good boarding school story and, for the most part, this one really suited me. A Patriotic Schoolgirl is a marvelous window into the requirements, customs, and rituals that surround boarding schools at that time. Brazil goes into great detail about these things and, I have to be honest, just reading the requirements of what each girl was expected to bring with her boggled my mind. And Brackenfield College is a strict school with a hard-nosed headmistress, one that for most of the book feels like a good fit for Dona, but definitely not for Marjorie. In the end, though, Marjorie learns to adhere to school values and principles, to comport herself accordingly, and to find a more gentlewomanly outlet for her patriotism. I do wonder at this message, however. 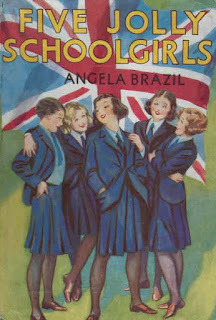 It was fun to revisit A Patriotic Schoolgirl and if you would like to read it, too, you can download a copy at Project Gutenberg, along with 27 other books by Angela Brazil. 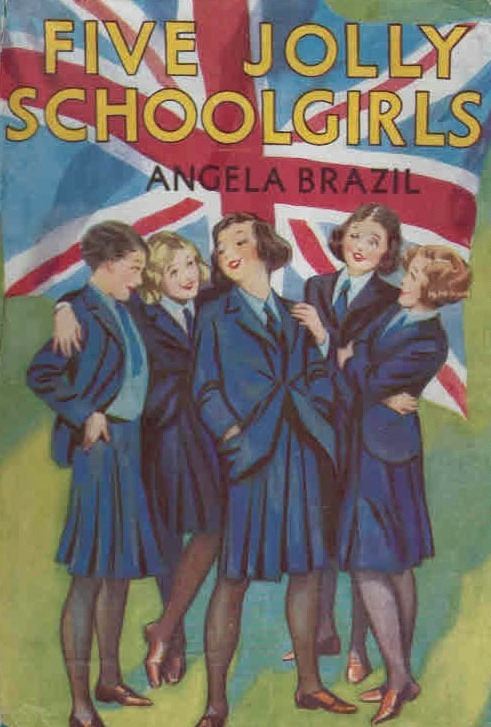 Going through all those books, I also found a copy of Five Jolly Schoolgirls, a 1941 WWII book by Angela Brazil that I also haven't read in years, so maybe it's time to revisit that one, too.